I'm sure you've heard we are once again living in the golden age of butter. Butter makes everything better, and I can't tell you how liberating it is to just use it without the guilt of the low-fat '90's plaguing me. My whole outlook on fat has obviously changed for the better over the past several years, and strangely I not gained a single pound in the process (well, not counting the gains and loss of baby weight...). While eating more fat, I have also never purchased less prepared food in my life: in part due to our economic status, but even more because whenever I read a label, I lose my appetite. There are quite a few "convenience" foods that I haven't bought it ages and canned beans and tortillas top the list. For years, I quietly made my own corn tortillas using Maseca and an aluminum tortilla press that someone gave me years ago. 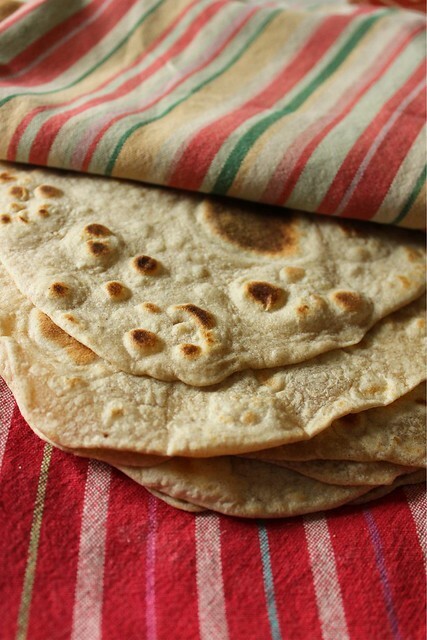 I never made flour tortillas; my Mom always made them without a recipe, and hers were untouchable good. Then two things happened. My aluminum press broke, and Deena posted about some whole wheat flour tortillas that I tried and loved. They were made with a ratio, not by feel and I could handle that. I used her post as my only recipe for a long time, probably exclusively for about a year after my tortilla press bit the dust. Then by chance, I was leafing through Peter Reinhart's Crust and Crumb - still one of my favorite bread books ever. How had I never seen there was a tortilla recipe there? How could a tortilla made with softened butter be bad? I had to experiment. Not only are these consistently good, I found that I could use virtually any flour and have them turn out wonderfully. I've used all whole wheat and part whole wheat, high-protein bread flour, or spelt, or whatever I've had ground and needing to be used up. I remember to take out some butter early in the day and by the time I'm ready to mix up the dough it's soft and ready to go. Before being forced to master the flour tortilla, I never let my cast iron heat up long enough. Awhile back, my Mom bought me a double burner cast iron comal when we were shopping at our favorite "junk shop". It was like new, and took very little reseasoning to get it conditioned. This allows me to make tortillas twice as fast. A batch of 8 can be done in about 20 minutes if I let the iron heat for about 10 minutes before I'm ready to start griddling them. And 20 minutes standing over my stove tending to the rest of the meal simultaneously makes me feel like the best kind of multitasker. I like to mix up the tortilla dough several hours before using it. It seems to hydrate the dough - and somehow makes the whole process feel like less work. Many times, I'll cook the tortillas before I even start the rest of the dinner - nestling them in blankets of tea towels to keep them warm and pliable. I used to try to roll them too thin, now I aim for a slightly more substantial feel. I'm also lucky to have a Roul'Pat for my counter, which lets me use less flour when rolling too. I use that for all of my breadmaking as well, so I'd recommend it as a good investment if you do a lot of baking, or as a gift for someone you know who does. I form the dough into balls, and then let them sit up to several hours until I'm ready to griddle them. I find this makes the perfect amount for one meal with perhaps a few leftover depending on our appetites. Double the recipe easily if you'd like more. They do hold well for a few days in the refrigerator, but then I like to steam them in some sort of creative stovetop contraption before serving them. If toasted, they become nicely brittle: make them into homemade chips or tostada shells easily by baking them for 10 minutes or so at 350. Divide the dough into 8 equal pieces, and roll each piece into a tight round. Cover with a bowl (the same one used for mixing works) or plastic wrap to keep them from drying out. Heat iron skillet over medium to medium-high for 10 minutes before cooking them (a drop of water should sizzle and evaporate quickly - you'll need to reduce the heat then because the cast iron retains heat so well). 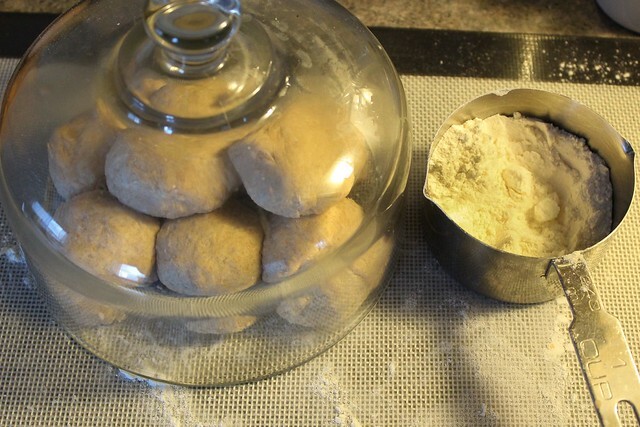 Roll out each ball of dough to about an 8 inch circle using a bit of flour. Try not to have an excess of flour as you transfer them to the pan or they can burn on the griddle. Cook on the first side until large bubbles start to form, then flip and cook the on the opposite side. Once browned, flip over if needed to finish cooking on the first side. Meanwhile, you can roll your next tortilla and have it ready to go by the time the first one is finished cooking. Stack the just cooked tortillas in a stack of tea towels to keep them warm. So just why haven't I bought another tortilla press yet? 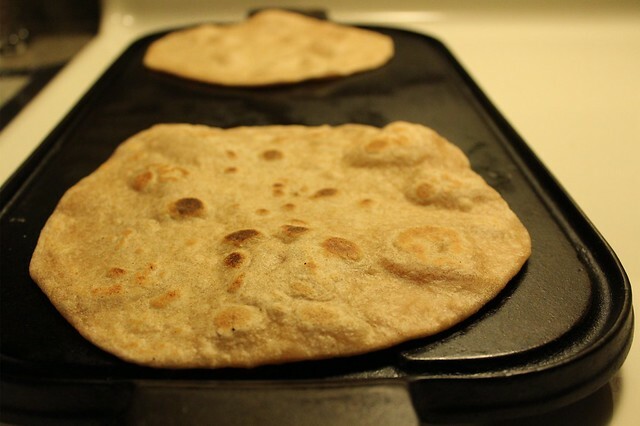 In part because flour tortillas are just so good. I also really do not want to waste money on another cheaply made aluminum press. I have my eye on this $75 beauty, but better I want to have my brother make one for me. With wooden plates more than an inch thick, it won't warp and will always press a tortilla perfectly flat... not to mention it will be something I'll have forever. I'm actually glad I don't have one yet because in the time frame since I've been missing it, Mexico went corn-GMO free - so the Maseca of the future will be better for all of us. Necessity is the mother of invention, and in my case, the mother of mastery since I no longer am phobic of making sub-par flour tortillas. They still aren't my Mom's, but they are very good and I can make them almost as fast as corn tortillas. I generally make something involving the tortilla once a week, so this past year I might have made as many as 30 dozen tortillas, and I am now completely sold on them made with butter. Just this week I saw that America's Test Kitchen released a tortilla making video, not using butter but also using warm water. Give it a look for some science behind that - and for another recipe to try.